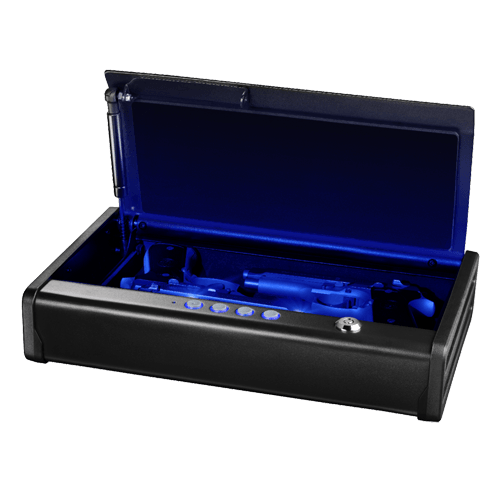 QAP2EL XL Quick Access Digital Pistol Safe with LED Interior Lights is rated 3.8 out of 5 by 6. The SentrySafe QAP2EL features two pistol capacity, programmable interior LED lights, whisper-quiet entry and pry-resistant solid steel construction. This safe is a must-have for firearm security. This safe is also California DOJ Certified for firearm storage and protection. Automatic door opening when your safe is unlocked for fast, quiet, and discreet entry. This battery-powered digital locking system uses a programmable 1-8 digit code. Offers multiple user options. Rated 1 out of 5 by MGEB from Gas Strut does not open door only 90 day warranty This safe is built well but the gas strut will not open the door after 6 months of use. Sentry will not warranty the strut out and admitted they do have issues with the struts. Sentry does not back their products. I would look else where when purchasing a home safe. This is a major issue to me when it comes to protecting my loved ones and your safe may not open. Rated 5 out of 5 by John65 from Exactly as promoted 5 stars, the only issue was self-inflicted! I was expecting led lights, but I didn't order correctly on Amazon. I chose the default, which has just the digital lock. Rated 5 out of 5 by Sam Fisher from Very strong and secure safe has good weight to it This safe is awesome, its low profile and i keep a full size pistol with laser/light combo and extra mags and tools in there with no problem. I love the design and low profile while still having a very strong and heavy build so that kids cant get in it. Also has nice lights on the buttons so you can use it easily in the dark. Great safe overall!!!! Rated 5 out of 5 by Sulli from Excellent Safe This safe is excellent as I wanted a quick and easy way to secure and lock-up my firearms quickly and safely. I can quickly retrieve when carrying and I love the LED Interior Lights. Very cool effect. Would recommend. Rated 2 out of 5 by Brig from Great safe for a year. This was a great safe for a year. Unfortunately now it’s pretty useless due to the gas strut failing. The lid opens just enough to get a flathead under it to open. Not really an ideal scenario for a pistol safe. Spend a little more and get a better safe. Rated 5 out of 5 by Ron in Seattle from Good Safe Safe is good. Requiring too many words for the rating is bad.